This course covers methods, limitations, and benefits of both esthetic and functional crown lengthening. You will leave with a better understanding of these principles to be able help patients enjoy better and more predictable results. 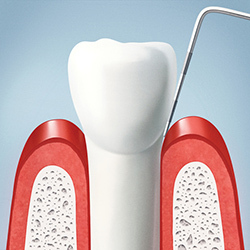 These principles apply to both posterior and anterior teeth, and both will be covered. Participants will see how crown margin proximity to soft tissue can adversely impact their restorative results and result in tissues that are red and sore at times. Discussion points include making diagnostic decisions regarding crown lengthening from both radiographic and clinical perspectives. It includes a detailed discussion of Biologic Width and how that impacts restorative decisions. This course will enhance your restorative results with basic “management” of the soft tissues. This is not another version of “Soft Tissue Management” from a scaling and root planning perspective, but rather a way to see how periodontal surgery for augmenting and/or moving gingiva will give you better restorative results. Attendees will see useful methods for improving soft tissue appearance around natural teeth, restorations, and implants. Techniques discussed include Free Gingival Grafts, and Connective Tissue Grafts. By illustrating with both slides and multiple case examples, participants will see the indications and benefits of these procedures, and learn how they directly impact better restorative results. Dr. Kohner is a leading specialist in the periodontal world of dental health. He is an expert in the management of periodontal infection using non-surgical methods, as well as being current on the latest procedures relating to surgical therapy. He has presented at the American Academy of Periodontology meetings for many years and presented lectures at the Harvard School of Dental Medicine. He now teaches for the Perio Institute (since 2003) and is a current member of both the American Dental Association and the American Academy of Periodontology, plus is a professional member of the National Speakers Association. With over 35 years in private practice and more than 20 years teaching, Dr. Kohner has the experience to make his courses meaningful. If your goal is to learn about what it takes to deliver new procedures to your patients, then his programs will give you the information you need. ​This program is suitable for all office personnel and the Crown Lengthening session in the morning is recommended for Laboratory Technicians.